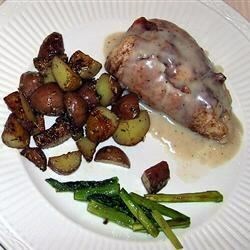 "This is a yummy take on stuffed chicken breast. The prosciutto and apple compliment each other nicely!" Preheat an oven to 350 degrees F (175 degrees C). Grease an ovenproof baking dish; set aside. Combine chopped apple and the 1/8 teaspoon apple pie spice in a small bowl; set aside. Place the chicken breasts between two sheets of heavy plastic (resealable freezer bags work well) on a solid, level surface. Firmly pound the chicken with the smooth side of a meat mallet to a thickness of 1/4 inch. Place one slice of prosciutto on each chicken breast. Place 1/4 of the apple mixture on each chicken breast. Roll up each breast and secure with a toothpick. Sprinkle the 1/2 teaspoon apple pie spice all over outside of chicken breasts and place into the prepared baking dish. Bake the chicken breasts, uncovered, in the preheated oven until no longer pink in the center and the juices run clear, about for 25-30 minutes. An instant-read thermometer inserted into the center should read at least 165 degrees F (74 degrees C). When chicken is almost done, melt butter in a small saucepan over medium heat. Whisk in flour to make a smooth paste. Whisk in milk and pepper; bring to a boil. Cook and stir until thickened and bubbly, about 5 minutes. Serve sauce over chicken. This was a great recipe. Just add some white cheddar, more apples and salt. The white cheddar gives it just enough sharpness. I just brought it to a couples get together and it went over well. This dish was great! I changed prosciutto for bacon and used maple syrup instead of apple pie spice! it turned out great!! My husband loved it and asked for seconds!! pretty good, but not fantastic...needs a little more something...tiny bit bland, but we ate it all anyway...I'm thinking the sauce needs some zing. Tried this last night. Excellent! Easy to make and "wowed" my husband who is not a big fan of chicken.